This is a variation of my first pattern “City Stars”. Kits and patterns will be available for both in December 2010 so stay tuned. The pieces are individually cut, arranged on the background and then appliqued. Kate Spains 12 Days of Christmas dances on the bella solid – Lime. I'm sorry to say that I'm not familiar with this pattern 🙁 It's fantastic!! are those diamonds appliqued? wonderful!! You made this?!?! This star is incredible! I don't understand, did someone piece all of those little diamonds and then space them all just so? That is amazing!!! The Lone Star was one of my grandmothers favorite patterns to piece and she could piece it meticulously. I think this variation looks easy to do and I may just give it a whirl. I have always shied away from piecing it the regular way our grandmothers did because setting in those corners and sides proved to be too hard. I always had puckers. Ooooooooooo ! 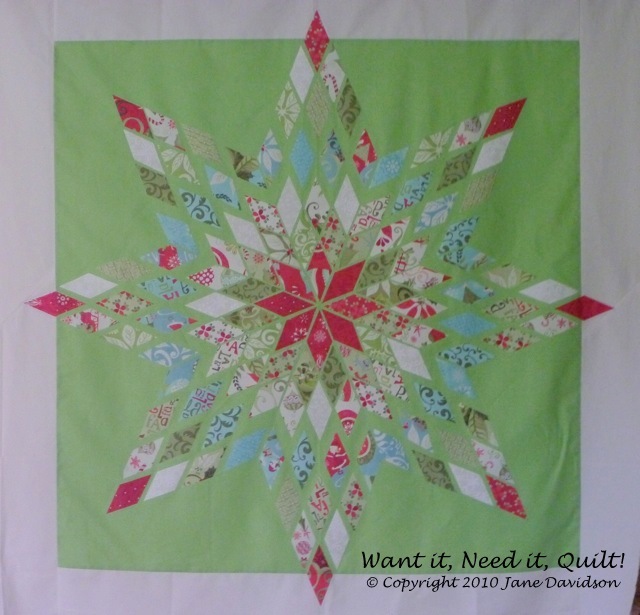 I love this applique version of Lone Star, very original !